Honoka was in the taxi racing towards the Mikados’ resort, calling Michiru over and over again. She sent a few messages, but never got any replies. Koremitsu called regarding Michiru in the evening, and then, Yū anxiously called. That was when Honoka learned of Shioriko being abducted. That was the reason why Koremitsu stammered, asking if there was anything strange with Michiru. Honoka gasped a few times as she heard Yū’s words. Koremitsu was saying that Michiru was with Shioriko. In that case, did it mean that Michiru abducted Shioriko? She could not believe that the ever serious Michiru would ever do such a thing! Koremitsu told Honoka to wait quietly, but the latter just could not do so. She decided to give chase after Koremitsu, and Yū too requested the same. Honoka found it strange that she was working together with her love rival Yū. However, she was a lot more relieved that she was not going alone. Honoka heard from Yū that Koremitsu went off to the Mikados’ resort, so she gave a call to Tsuyako, but could not get through. Thus, she could only give calls to the students at school asking for the address. They took the train to the location, and then got on the taxi they had arranged for beforehand. The car was bumping about on this road that was not practically not paved at all. The windshield was dampened by the rain, and the front was completely dark. Suddenly, she saw an orange light in the darkness. 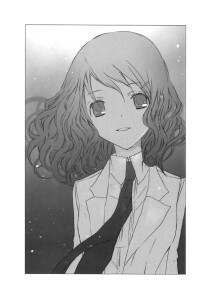 Only a section of the riverbank was lit, and Michiru stood there, wearing her school uniform, showing a faint smile. On a closer look, Koremitsu too was holding a torchlight, standing in front of Michiru. The ruffled red hair was soaked by the rain, sticking onto his face. Koremitsu shone the torchlight at Michiru, glaring at her. Two women in raincoats were standing behind him, seemingly leaning upon him. The only things shining on each other was merely the torchlight both parties have. In the glaring light was Michiru, soaked all over in her blazer, pleated skirt and kneesocks, grinning away. Before he came to this place, Koremitsu did receive the message from Asai, notifying him that they found Shioriko’s whereabouts. Shioriko probably would be saved by Asai and the others, unless Michiru had an accomplice. In any case, Koremitsu could not forgive her for involving the elementary school girl Shioriko. Hikaru, standing beside Koremitsu with a grim face, was pained so much, his face was writhing. The rain was slightly abated, permeating through his slender body, and the tender hair strands swayed silently in the rain. Such a scene was really fleeting, empty, and Koremitsu again realized that Hikaru was a ghost. Michiru spoke with a sickeningly, sweet voice, shocking Koremitsu. It was likely that Koremitsu, who was supposed to pass on Hikaru’s words, caused Michiru to think that Hikaru had possessed him. In fact, Hikaru could not leave Koremitsu, so in a certain sense, she was right. But if Koremitsu was to admit to this, the situation will get complicated. Surely Fujino and Mikoto, watching from behind, would be completely confused. The smile instantly vanished from Michiru’s face. She lowered her head, her eyes showing a gloomy shadow. That sight of her unnerved Koremitsu. He asked, and she slowly raised her face. The damp skin showed an alluring gloss, and the lips curled into a confident smile, the pale flames flickering in the eyes. The embodiment of the spider that was worshipped in the garden of the Udates, having devoured the husband and his mistress. Michiru blurted from her lips the woman’s name that horrified Tsuyako, whom Kazuaki worshipped, with a malicious smirk on her face, and that caused Koremitsu to be dumbfounded. Koremitsu saw Yū’s long hair as she walked silently behind Honoka, soaked in the rain. He widened his eyes. Yū’s long skirt too was soaked, sticking to her legs. Honoka insisted, shaking her damp hair aside. Suddenly, a sarcastic voice could be heard. Michiru gave Honoka an icy glare, and Honoka’s face immediately froze. She muttered with a sweet voice. Both Honoka and a scowling Koremitsu, listening in on their conversation, were dumbfounded. Fear appeared in Honoka’s eyes, and she asked Michiru. Koremitsu recalled the silver bracelet. The bracelet was placed at the steps Hiina fell from. He thought that definitely was Honoka’s, was rattled as a result, and questioned Honoka. Yes. Michiru did say that she too bought a bracelet similar to Honoka. That was actually left there by Michiru! The smirk on Michiru’s face intensified. This time, it was Hikaru giving the same reaction Koremitsu did. When Hikaru was in the elementary school, he declared an oath of love to 5 different girls in the back garden, a ripe place for confessions. After that happened, Hikaru was neglected for a few days, and at that moment, a kind girl sent letters of folded white flowers to him. The culprit harassing him was actually that White Flower herself. Honoka’s mouth was half-opened, but it seemed she could not say anything as she curled her lips painfully again. Koremitsu was so infuriated his head was about to explode. The difference between that Michiru and this smirking Michiru was way too different, and caused a migraine in Koremitsu’s head. Michiru’s face suddenly turned serious. Michiru’s eyes again flicked a bewitching glint. The rain pelted upon her cheeks and forehead, the droplets dripping from her chin and eyebrows. Fujino probably was standing together with Mikoto behind Koremitsu, yet she did not say a single word. Why was it that Michiru’s frustrations with Honoka was related to the promise between Fujino and Hikaru? Koremitsu was left flabbergasted. Michiru’s words shocked Koremitsu. Hikaru too looked dumbfounded. Did Michiru see the shrine in the Udates? One had to wonder whether her meeting with Rokujō was just a delusion when she was young, or something actually happened that caused her to think this way. But the existence of Rokujō was ingrained in Michiru’s heart back then, showing on her from time to time, seeding calamity. It started when she was very young—in elementary school, in fact. Now that Hikaru died, Rokujō still remains alive! Koremitsu was thoroughly soaked by the rain, and by the time he realized it, he found his mouth to be dry. Michiru slowly raised her lips. The white face shown by the torchlight was innocent, yet at the same time, showcasing the alluring charm of a matured woman. She was smiling, but the icy hatred, malice, bitterness and frustration spread in her eyes. Those were the dark emotions targeted at Hikaru’s beloved. Yū, standing silently beside Koremitsu, shivered slightly, her petite face looking terrified. Michiru’s hair was sticking to her face. Hikaru was about to shout. But Michiru was faster, the frosty light in her eyes flickering with intense emotions as she gently raised her hand, clearly pointing at the one behind Koremitsu.